Wildlife are everywhere in Black Rock-High Rock Country, even barren parts of the playa. 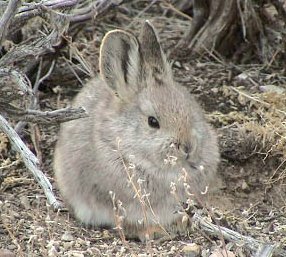 In addition to familiar species like bighorn sheep, falcons, and mule deer, look closely and you may also spot pygmy rabbits, fairy shrimp, and two-inch-long Pacific chorus frogs. Wherever you end up exploring, the best times to view wildlife are near dusk and dawn when temperatures are cooler. Remember to keep your eyes open for wildlife that often blend into the background hues of the landscape. One of the best places to view wildlife is High Rock Canyon. Here, you’re likely to see bighorn sheep on the steep canyon slopes and hear the calls of the chukar and quail echoing against the walls. Great horned owls, red-tailed hawks, prairie falcons and golden eagles all nest on the tall cliffs of the canyons. Beyond the canyon look for sage grouse, coyote and pronghorn antelope on the open sage-brush covered hills. During the hot summer months these species can be found near springs where water and green vegetation are found. The highest elevations on the Calico Mountains, Black Rock Range, Jackson Mountains and the Massacre Mountains area are home to healthy populations of mule deer. These animals seek palatable shrubs, tall brush, and shaded canyons for cover. If you look closely you may see a pygmy rabbit in the tallest sagebrush stands. The dunes and hummocks that surround the barren Black Rock Desert playa are habitat for kit foxes, antelope, ground squirrels, kangaroo rats, horned lizards, badgers, and rattlesnakes. If you visit the area when the playa is flooded, you may be able to find fairy shrimp or tadpole shrimp in the flood water. 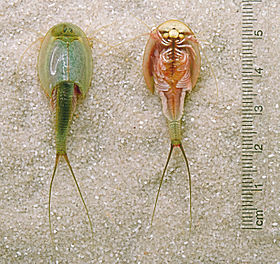 When the playa is flooded, dormant eggs hatch, and these invertebrates grow rapidly to over three inches in length, mate, and then die as the playa dries. Their eggs live in the surface layer of the playa waiting for the next flooding. Below are descriptions for many of the most commonly viewed wildlife species in Black Rock-High Rock country. 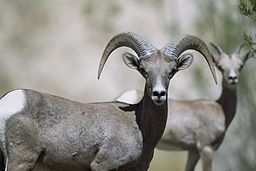 Graceful and sure-footed, bighorn sheep master steep, rugged mountainsides that are inaccessible to other animals. Perfectly camouflaged, they are a rare but rewarding sight. The ram’s massive, coiled horns account for as much as 10% of his total body weight. During the breeding season the crack of butting horns resonates throughout the canyons as males compete for females. Desert bighorn can be seen in groups of 8 to 20 in the High Rock Canyon area. Often referred to as “antelope”, pronghorns are not antelope at all, but rather the only sepcies in the genus Antilocapra. Both sexes have horns which are typically smaller or unnoticeable in females. Covered in dark keratin sheaths, the horns are shed annually. Look for bands of pronghorn in areas dominated by sagebrush and grasses. 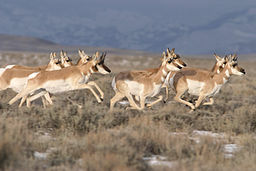 But look quickly–pronghorns can run up to 40 miles per hour! Pronghorns are regularly sighted throughout the NCA. Large ears, a long, black-tipped tail, and uniform body and leg color identify this small fox. Well adapted to desert climates, the kit fox spends summer days in the cool comfort of one of its many dens, emerging in the evening to hunt Black-tailed jackrabbits and other prey. Dens are most often found in sparsely vegetated, sandy soils. Family units stay together from spring until late fall when the puppies disperse. 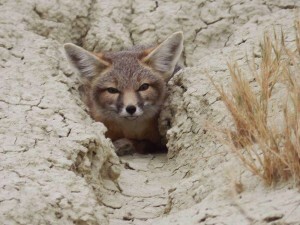 Kit foxes can be seen in the dunes and hummocks surrounding the Black Rock Desert playa. 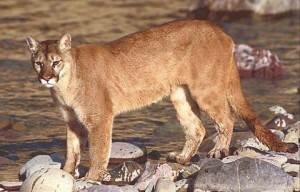 An excellent stalk-and-ambush predator, the mountain lion pursues a wide variety of prey. Primary food sources include ungulates such as deer, elk, moose, and bighorn sheep, as well as domestic cattle, horses, and sheep. If you are lucky enough to see one of these amazing predators, make yourself look and sound bigger that you are and never turn your back or run away! Named for the black streak on the top of its tail, this large-bodied, long-eared resident is common in western grasslands and open areas. Raptors, fox, cougars, and bobcats hunt the jackrabbit as a dietary staple. The pygmy rabbit is one of only two rabbit species in the U.S. to dig its own burrow. Pygmy rabbits are the world’s smallest rabbit species with average adult weights from 0.83 to about 1.1 pounds, and a body length from 9.3 to 11.6 inches. The females are slightly larger than males. The pygmy rabbit is distinguishable from other rabbits by its small size, short ears, gray color, small hind legs, and lack of white fur on the tail. 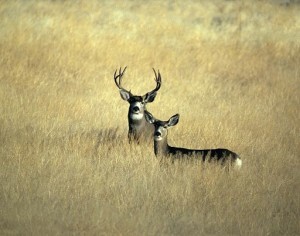 Widespread throughout the western United States and Canada, mule deer are frequently seen individually or in small groups within the NCA. Mule deer migrate from their summer range in the mountains to spend the winter in lower elevations where browse is more accessible. One of the largest rodents in North America, yellow-bellied marmot habitat ranges from the sagebrush steppe to alpine meadows. In summer they forage heavily on a variety of grasses, forbs, flowers and seeds to store fat for the long winter hibernation. Their burrows, dug among rocks, protect them from predators and seasonal temperature extremes. Summer and nesting burrows may be as shallow as three feet, with winter hibernation burrows as deep as 15-21 feet. One of the rare animals that are active throughout the summer day, this squirrel runs with its light colored tail curled over its back. The heat-reducing behavior of using its tail as a sunshade, plus specialized physiology, makes this squirrel well-adapted to hot dry summer conditions in a wide variety of environments. Eating green vegetation, seeds, smaller rodents and insects, they in turn provide food for a variety of raptors, coyotes, fox, badgers and many snakes. If you’re a bird watcher, you’ll find excellent opportunities to pursue your passion throughout Black Rock-High Rock country. And if you’re not, you’ll still thrill to the sight of a peregrine falcon soaring majestically over the landscape, or enjoy the sweet notes of a meadowlark’s song. Numerous species of songbirds breed in the many habitats. Cliff and rim country support high densities of nesting raptors. Sagebrush communities are home to sage grouse leks, the communal breeding ground of the sage grouse. More than 250 species of neo-tropical birds and many other water birds stop in Black Rock-High Rock country for varying lengths of time. When wet, especially in spring, the playa is a favorite place for these winged visitors to rest and feed. If the playa is wet for a month or so, the shallow waters teem with newborn fairy shrimp. The edges of the playa and the Quinn River sink stay wet longer than the rest of the playa, which concentrates the fairy shrimp and migratory birds in those areas. The Audubon Society has identified the High Rock Canyon area as an Important Bird Area (IBA). The IBA contains a rugged, steep defile that shelters at least five species of nesting raptors, a large concentration of cliff and violet-green swallows, and whitethroated swifts. Desert shrub communities, along with adjacent riparian thickets and perennial water in the canyon floor, increase habitat complexity and species diversity. Upper High Rock Canyon near Stevens Camp contains healthy aspen stands along the creek within a narrow rimrock-bound canyon. These habitats are popular with birders to see wrens and warblers, as well as eagles and falcons. Nearby High Rock Lake supports spring migratory waterfowl and shorebirds during times of adequate precipitation. The High Rock area also supports healthy sage grouse populations. A visit to the area in early spring may reveal strutting males on their leks. The Mahogany Canyon area, just north of the NCA, contains extensive riparian and snow pocket aspen stands. These stands support a myriad of songbird species associated with the aspen, willow, and adjacent sage brush communities. 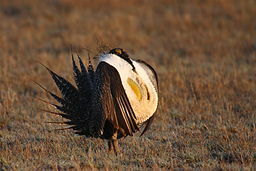 Once seen in great numbers across the West, greater sage grouse have declined in number over the past century because of the loss of sagebrush habitats essential for their survival. Greater sage grouse are the largest grouse in North America. They forage on the ground eating insects and plants within sagebrush habitat. Sage grouse are notable for their elaborate courtship rituals. Each spring males congregate in leks and perform a “strutting display.” Groups of females observe these displays and select the most attractive males as mates. Greater sage grouse can be seen in East Fork High Rock Canyon, High Rock Canyon, and Little High Rock Canyon. 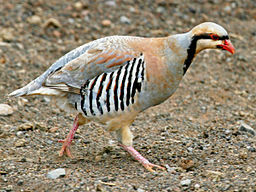 Chukar are a species of pheasant introduced to the United states as a game bird from Asia. Chukar hunting season typically runs from October to February. For more information on hunting regulations for chukar, visit the Nevada Department of Wildlife upland game hunting webpage. 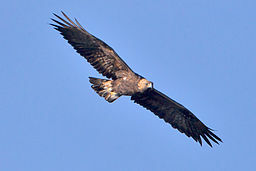 Golden eagles have a wingspan of 5.9 to 7.7 feet and can weigh up to 14 pounds. This species prefers to nest in rock formations which are abundant throughout the NCA. Golden eagles are opportunistic and have been documented preying on up to 200 species of animals. Golden eagles can be seen in the Calico Mountains, East Fork High Rock Canyon, High Rock Canyon and Little High Rock Canyon. Peregrine falcons were once listed as endangered due to DDT but the species was removed from listing in 1999. The Peregrine is the fastest member of the animal kingdom, reaching speeds over 200 mph during its characteristic hunting stoop (high speed dive). This species preys primarily on birds but will also eat mammals, reptiles, insects or amphibians. Peregrine falcons usually nest near water on rocky cliffs. 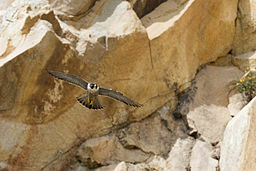 Peregrine falcsons can be seen in High Rock Canyon. 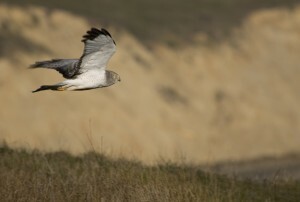 Northern harrier are easily recognized by their long tail with a white stripe across the top and their habit of gliding low across the desert. They prey primarily on small mammals, but occasionally capture small birds. Northern harrier have owl like heads with exceptionally good hearing and often locate their prey using this advantage. 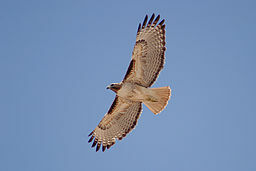 Red-tailed hawk are the most common hawk in the NCA and can be seen soaring on thermals. This species is distinguished in flight by the reddish-buff color of its tail and its hoarse, rasping scream, described as kree-eee-ar. Western burrowing owl chicks or owlets can make a sound almost identical to a rattlesnake when threatened. 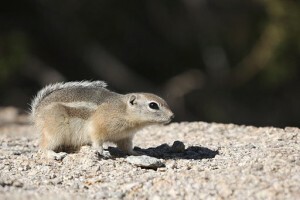 This species nests in burrows dug by other animals such as fox or ground squirrels. 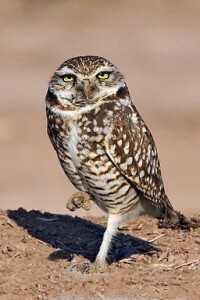 Western burrowing owl hunt small mammals, insects and occasionally reptiles by running along the ground or swooping down from a perch. They are not entirely nocturnal and are active both day and night. 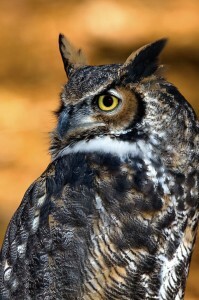 The great horned owl is distinguished from other owl species by its “horns” which are not ears but rather tufts of feathers. This large owl’s talons are capable of 300 pounds per square inch of pressure which is comparable to a Golden Eagle. Great horned owls hunt from tall perches at night and use their binocular vision and asymmetrical ears to locate their prey. This species preys on small mammals, birds and reptiles. 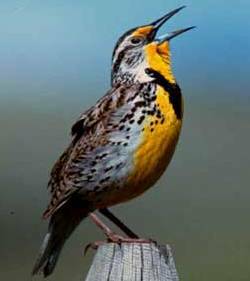 Meadowlarks have a beautiful flute-like warbled song that males often sing from perches during breeding season. This species nests on the ground and primarily feeds on insects. Meadowlarks can be seen throughout the sagebrush steppe of the NCA. 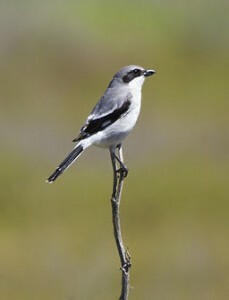 Loggerhead shrike is also known as the “butcher bird” because they impale their prey on sharp plant thorns, yucca leaves or barbed wire. This medium sized bird swoops down from a perch to capture large insects and even lizards before impaling them to save for later. If you find a grasshopper impaled on a barbed wire fence, the culprit is likely a shrike! 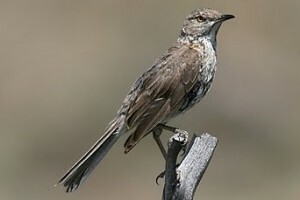 Sage thrasher, as their name suggests, only nests in dense stands of sagebrush. The species is migratory and spends the winter months in parts of the southwest and Baja. This elusive bird will sometimes run along the ground when disturbed rather than taking flight. The continued decline of sagebrush habitats in western North America is cause for alarm for the Sage thrasher and other sagebrush dependent species. Sage thrasher can be seen around High Rock Lake. Killdeer are easily recognized by the loud “shreek” they make as you approach them. They nest on open ground in a small depression lined by rocks and their spotted camouflaged eggs blend in with the surroundings. 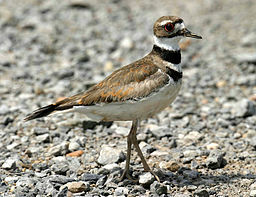 Killdeer are common throughout the NCA and commonly nest near springs. Fish, in the desert? 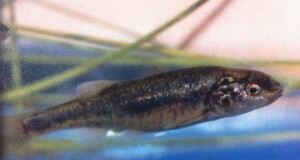 One of the most impressive species of the NCA is the dainty desert dace. It is a small minnow endemic to the springs and hot creeks of Soldier Meadows. Its tiny body is capable of withstanding water temperatures up to 100 degrees F! Download a poster of Nevada Native fish here featuring illustrations by Joseph R. Tomelleri . Lahontan cutthroat trout is a threatened fish species native to lakes and streams throughout the physiographic Lahontan Basin of northern Nevada, eastern California, and southern Oregon. Current populations exist in approximately 155 streams and six lakes in the Lahontan Basin. Desert dace is endemic to the Soldier Meadows Area of Critical Environmental Concern within the NCA and is listed as threatened under the Endangered Species Act. This small minnow species, not known over 7.7cm in length, has one of the highest temperature tolerances of any fish and can live in water up to 100 degrees F! It feeds on small invertebrates, mainly insects, and eats some algae within the springs of Soldier Meadows. Desert dace is threatened by the non-native carnivorous green sunfish and the rerouting of springs for bathing and grazing. SEE THE DESERT DACE IN ACTION IN THIS VIDEO! 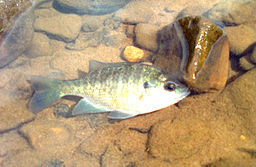 Green sunfish are native to eastern North America and were introduced to waterways in the west for fishing. This species is a fresh water panfish that preys on small fish including the threatened desert dace. As its name suggests, the giant fairy shrimp can grow up to 7 inches long! This species lives on the surface of the playa where it lays its egg like cysts in the top few millimeters of soil. 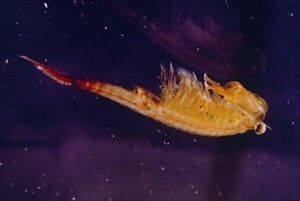 Giant fairy shrimp are an important source of food for migratory birds in the spring. 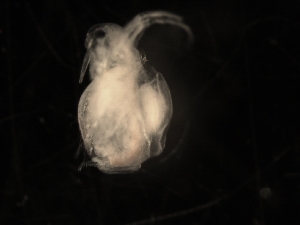 Water fleas have a translucent exoskeleton and are extremely sensitive to toxins such as detergents, metals and chlorine. The structure of tadpole shrimp has changed very little over the last 70 million years and it is considered a “living fossil.” The latin name Triops is derived from the Greek term tria, “three,” and refers to this shrimp’s three eyes. Throughout the NCA many springs support springsnails that live nowhere else on earth. Soldier Meadows springsnails were recently discovered and are among approximately 100 aquatic molluscs known to exist only in the Great Basin. Nine species of snails inhabit the hot and cool springs of Soldier Meadows alone. Springsnails are most endangered by habitat alterations such as water diversions, rock dams, livestock overgrazing, and water depletion. Other species of springsnail that are endemic to the area include the Surprise Valley pyrg and the Fly Ranch pyrg. Across the NCA you are likely to see a desert horned lizard scurry across the road, great basin gopher snake sunning itself and if you are lucky a rattlesnake. This is the only rattlesnake in the northern two-thirds of Nevada. In summer they are mostly nocturnal. Normally aggressive, they are most dangerous when shedding a skin which blinds them temporarily. This non-venomous snake resembles the rattlesnake in coloration and mimics the threatened rattlesnake by flattening its head to a triangular shape, inflating its body to appear larger, and rapidly vibrating its tail in dry grass or loose gravel to mimic the rattler’s rattle. The spotted gray and orange bands of the Great Basin collared lizard’s back resembles the lichen on the rocks where it is frequently found. The borad, black collar is easily recognized as the lizard darts in rocky terrain searching for insects, spiders, and other lizards to eat. Desert horned lizards, often referred to as “horny toads”, are not toads but lizards. They have a “crown” of scales around their neck and throat. Desert horned lizards prey on invertebrates, such as ants, crickets, grasshoppers, beetles, worms, flies, and some plant material. Look for them in the vicinity of ant hills, where they sit and wait for ants to pass by. Desert horned lizards will shake sand over their backs to camouflage themselves from predators and allow them to hide from their prey. When threatened this species can shoot blood from its eyes up to five feet! Pacific chorus frogs range in color from green, tan, reddish, gray, brown, cream, and black, but most are a shade of green or brown, with pale or white bellies. They can be distinguished from other frog species by a black or dark brown eye stripe that stretches from the nose, across the eye, and back to the shoulder. 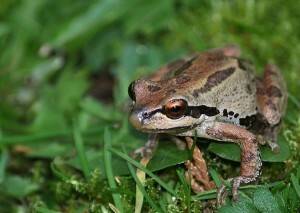 Pacific chorus frogs are very small and only grow up to two inches in length. 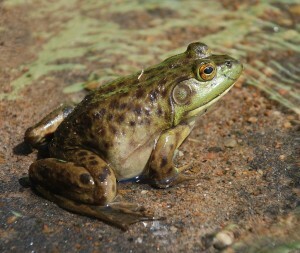 Bullfrogs are native to southeastern North America and were introduced to western states for “frog legs” as a food source. Outside of their native range, bullfrogs are a threat to other amphibians and invertebrates by competing for resources and consuming invertebrates, frogs and even birds! They can be distinguished from native frog species by their large size, 3.5-9 inches in length.